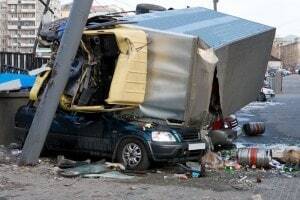 What are the top 5 causes of trucking accidents? Trucks are an important part of the economy. On any given day, California motorists share the road with tractor-trailers, delivery trucks, vans and other commercial vehicles. A truck accident is a life-changing event that can happen to anyone. Catastrophic collisions occur on primary and secondary roads and crowded interstates. Poor maintenance, reckless driving, fatigue and driver error are just a few things that can cause a deadly truck collision. To improve safety, the Federal Motor Carrier Safety Administration compiled the Large Truck Crash Causation Study (LTCCS), which examines five years of crash data and 1,000 variables. According to this report, safety violations are the leading cause of truck collisions. Equipment problems are responsible for two-thirds of truck collisions. One-third of all accidents are caused by service violations, such as operators failing to accurately maintain logbooks or driving for too many hours. Brake failure is the most common cause of accidents involving large trucks. Nearly half of all pre-accident violations are related to the truck’s braking system. Analysts found that brake problems were 50 percent more likely when the truck’s braking capacity was critical. Even when brakes are properly maintained, it takes a tractor-trailer 300 feet to come to a complete stop. Problems with lights were a contributing factor in one-fifth of big truck collisions. Although truck drivers are instructed to check all lights daily, many other commercial operators don’t take the same care. It’s always the driver’s responsibility to ensure that each light is working. A significant number of accidents are attributed to driver violations. Log violations are the most common. Drivers often make risky decisions, execute improper turns and break hours-of-service rules. Intoxication and fatigue also play a role. Tire violations and wheel detachment are dangerous problems. Mismatched, worn and deflated tires contribute to 15 percent of big truck crashes. Tire condition affects traction, stability and braking, particularly on wet or slick roads. Mechanical defects and inadequate maintenance are especially evident in a truck’s axles and steering systems. Faulty steering components are a contributing factor in 14 percent of accidents. Maintenance is important. However, truck drivers aren’t the only ones who cause accidents. Only one of every five truck collisions is caused by the truck driver. In those cases, the driver generally made an improper turn or was driving at an unsafe speed. Regardless of the cause, a collision with a semi has devastating consequences. Small trucks weigh 10,000 pounds, but a loaded 18-wheeler can weigh 30 tons. Even a small box truck weighs about four times as much as a mid-sized sedan. Victims who are hit by large trucks often total their cars, sustain debilitating injuries and lose months of income. In California alone, these accidents cost billions. Experts say that 3 percent of injury crashes and 8.5 percent of fatal accidents are caused by trucks. According to the Statewide Integrated Traffic Records System, trucks are involved in 5,000 injury crashes and 240 fatal crashes each year. Fortunately, accident attorneys can check records to determine if a driver should have been out of service and to pinpoint the cause of the collision.